What does your inner monster look like? 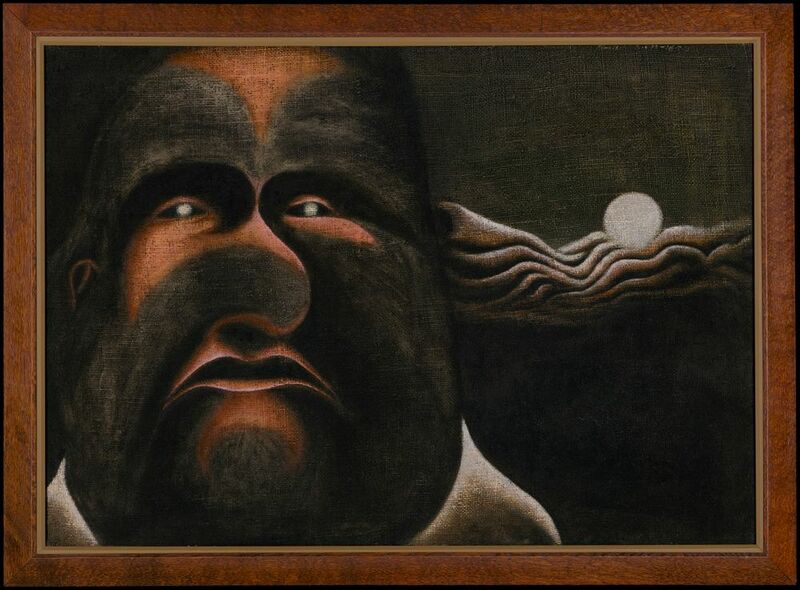 For New Zealand painter Tony Fomison (1939–1990) it was a creature drenched in darkness, his face covered in wolfish hair. Art curator Chelsea Nichols explains more. Fomison’s dark and enigmatic paintings gained prominence in the early 1970s, during a particularly troubled time in the eccentric young artist’s life. As the Christchurch artist battled his own inner demons, misfits and outsiders like asylum patients, prisoners, and the diseased began to appear on his canvasses. His paintings of this period explored otherness, and what it means to be set apart from so-called normal society. But Fomison’s paintings of hairy men and werewolves also give a fascinating glimpse into the artist’s inner sense of self. Fomison liked to tell people that he was born all covered in dark hair, as if he too was marked from birth as a monstrous outsider. (His mother, however, vehemently disputes this fact!). In this way, his ‘hairy’ paintings can be read as twisted self-portraits, embroiled in self-mythology. 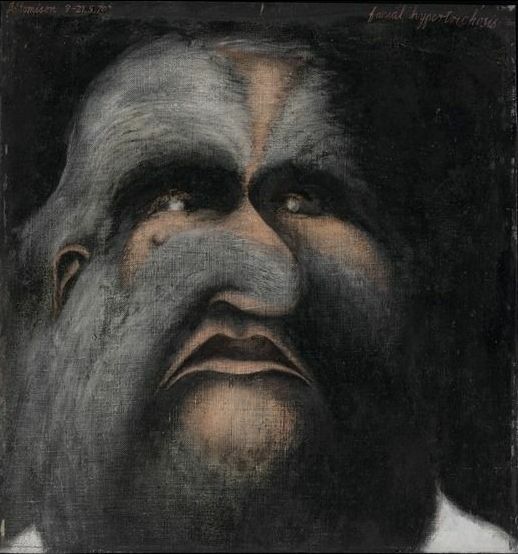 Facial Hypertrichosis (1970) depicts a man with a rare genetic condition called hypertrichosis, which causes abnormal hair growth all over the body. Fomison was often inspired by images of people with medical deformities that he found in old surgical textbooks. Fomison also called this painting his ‘Hairy Man of Mandalay’ – a reference to a family of 19th century freak show performers with hypertrichosis. They were often billed as the ‘Sacred Family of Burma’, cleverly re-branding their unusual condition as a cherished blessing rather than a horrible curse. Fomison embraces this ambivalence of the so-called ‘freak’, embracing his own outsider status with a similar sense of pride. I was a Teenage Werewolf, film 1957 (1970) by Tony Fomison. Oil on canvas. Private collection. 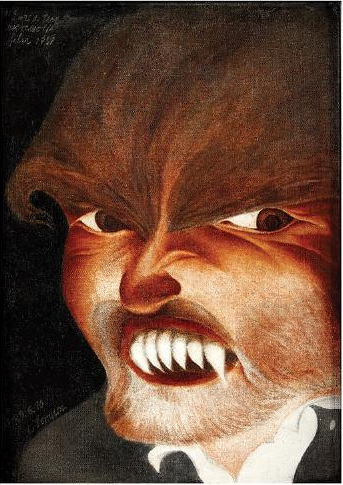 In I was a Teenage Werewolf, film 1957 (1970), the hairy man morphs into a snarling werewolf. Fomison was inspired by the campy 1957 film of the same name, which offers a modern twist on traditional werewolf lore. In this film, a difficult teenage boy is not bitten by an enchanted wolf – instead, he turns into a werewolf after his psychiatrist injects him with a dodgy serum. Fomison had spent time in mental institutions and prisons battling drug addiction, and had grown suspicious of psychiatry. He preferred the view that mental illness was an alternative rather than inferior state of mind. Here, Fomison’s werewolf is not a monster, but the product of a broken system unable to cope with young rebels. In Wildman (1973), a full moon has illuminated the werewolf’s eyes, triggering his monstrous transformation. Fomison often boasted about being a ‘terror of the bourgeoisie’. The title of this painting, likewise, describes something that can’t be contained or civilized. In this way, the werewolf can be read as a symbol of Fomison’s proud rejection of ‘normal’ society. Yet, there is something unmistakably sad in this painting too. The hairy man presses mournfully against the picture frame, as if peering through a window begging to be let in. The year that this work was painted, Fomison moved from Christchurch to Auckland to try and make a fresh start. Here, perhaps, it is the werewolf’s capacity for transformation that speaks most powerfully to the young artist. Tony Fomison: Lost in the Dark closes tomorrow – Sun 4 Nov.